Anyone who’s anyone in the food industry would know or would have heard of Chef Justin Quek. Widely applauded for being one of Asia’s most internationally-celebrated chefs, Justin Quek is famed for his expertise in French and European fine dining and his deep understanding of Asian cuisines—his signature Foie Gras Xiao Long Bao and Lobster Hokkien Noodles are key testaments to his skill and deep knowledge of both Chinese and French cuisine. 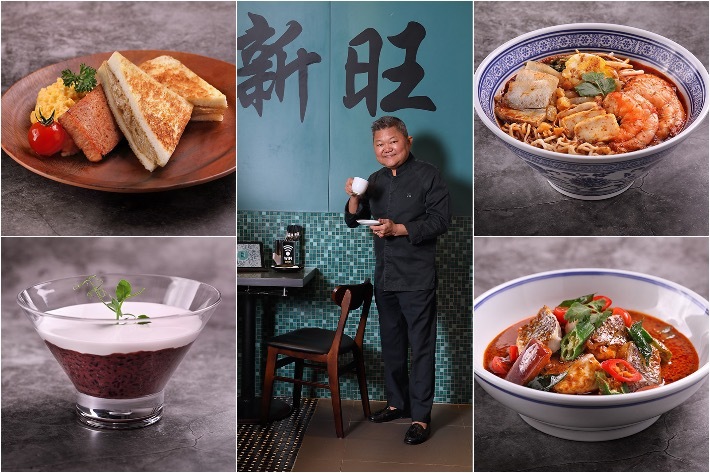 Come this December 2018, for a limited time only, the maestro himself is teaming up with selected Xin Wang Hong Kong Café outlets, to roll out a series of exclusive menu items, creating a medley of dishes that, while staying quintessentially Cantonese, see French-inspired interpretations as well. The first instalment of the series—slated to launch on 13 December 2018—includes a quintessentially Hong Kong experience intertwined with French precision. Inspired by Chef Justin’s culinary expertise and travel experiences, the menu will feature a refreshing twist to what Singaporeans already love about Hong Kong’s café culture. Each dish is carefully curated and underwent rigorous taste tests with Quek’s team of chefs, ensuring the finest balance in taste, portion and presentation. Among the slew of items to grace his elaborate menu, tuck into the edible likes of his Spicy Prawn Nissin Noodle, Red Snapper Fillet Curry, French Duck Foie Gras Pate Toast and for dessert, Pulut Hitam Pudding—a homage to a local classic.